Details of the report will be one of the key discussions at the Africa Hotel Investment Forum (AHIF), which the Kenyan government recently announced will return to Nairobi, in October this year. Marriott International currently has a development pipeline of 93 new hotels comprising 17,708 rooms in Africa. Almost 50% of those rooms – 8,587 – are already under construction. Most of fourth-placed AccorHotel’s deals are fairly new, signed in 2016 and 2017, and therefore it is not surprising that only 36 per cent of rooms in its pipeline are under construction. Best Western has just over 91 per cent of its pipeline rooms onsite. Louvre and Meliã, both have all their pipeline rooms under construction, which prompts the question: where are they looking to go next? This year’s pipeline report, now in its 10th edition, has 41 contributors, reporting 418 deals with over 100 brands. Year-on-year performance for Africa in 2018 shows growth, but more muted than in recent years – 25% growth in the number of pipeline rooms in 2015; 19% in 2016, and 13% in 2017, much the same as the 13.5 per cent growth in 2018. 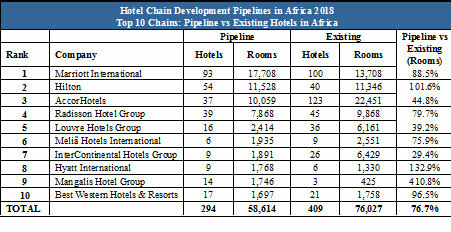 The overall pipeline for hotel chains in Africa looks healthy for the future. Notably, Mangalis, a new hotel brand launched in 2011, has already managed to build a significant pipeline, with 1,746 rooms in 14 hotels, growing the existing portfolio of 425 rooms in 3 hotels by more than four times. Currently five of the 14 hotels in the pipeline are under construction. But there is a word of caution from W Hospitality Group’s Managing Director, Trevor Ward: “Of the total 76,322 rooms in the African pipeline, almost 34,000 rooms are said by the chains to have scheduled openings this year and in 2019. The reality on ground, however, is that 4,000 of those rooms were not even under construction as at the time of our data collection - which was the first quarter of 2018! It would not therefore be amiss of us to suggest that there is a degree of over-optimism on the part of the chains regarding their expansion plans.